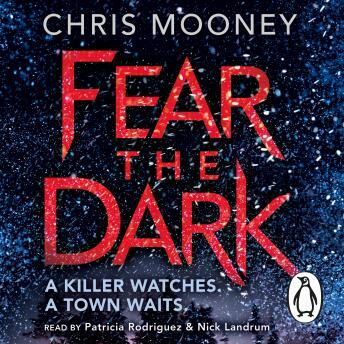 Penguin presents the unabridged, downloadable, audiobook edition of Fear the Dark by Chris Mooney, read by Patricia Rodriguez and Nick Landrum. As Darby navigates the blood-ties and broken promises that divide the locals, she knows all the while the killer is watching, circling his next target: her. She must not only meet evil and survive, but also be prepared to face this small town's dark heart. Started of well and sections of the story are engaging and certainly action packed. However some aspects of the way the book is written, particularly the repeated use of several phrases, started to irritate me. "Walked like gingerly stepping on ice" a woman/man "with the intelligence of a balloon/cucumber". On a personal note, I also not a fan of heroes (or heroins) who end up stepping outside the law justifying violent and criminal actions because they have a badge or some other authority related to position or office. To me that's a dangerous line to cross which I'm sure happens true enough in real life, just I find it undermines the character in the book who I'd like to respect. As to the plot and the eventual identification of the bad guys the story was solid with the majority of characters portrayed in a manner which both interesting and believable. Not sure if I will read another in the series. Three stars from me.